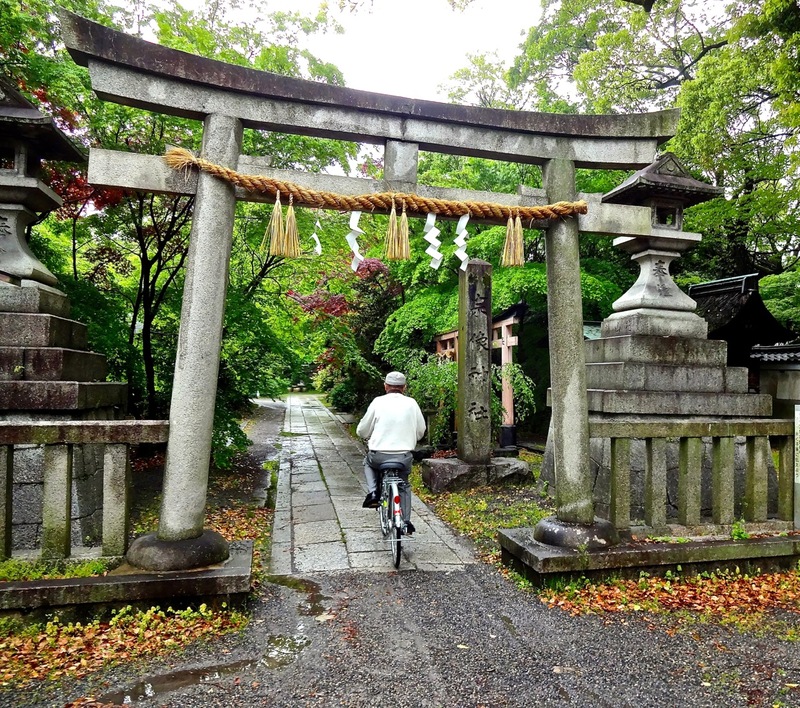 Riding under a tor and into a shrine near the Imperial Palace, a bicyclist makes his way on a drizzly Kyoto spring day. The contrast between China, our home for the past ten months and Japan couldn’t be more stark than Kyoto. Spending 7 days based in Kyoto was one of my best travel moves as it allowed us day trips to Osaka, Nara and Hiroshima while returning each night to arguably Japan’s most beautiful city. 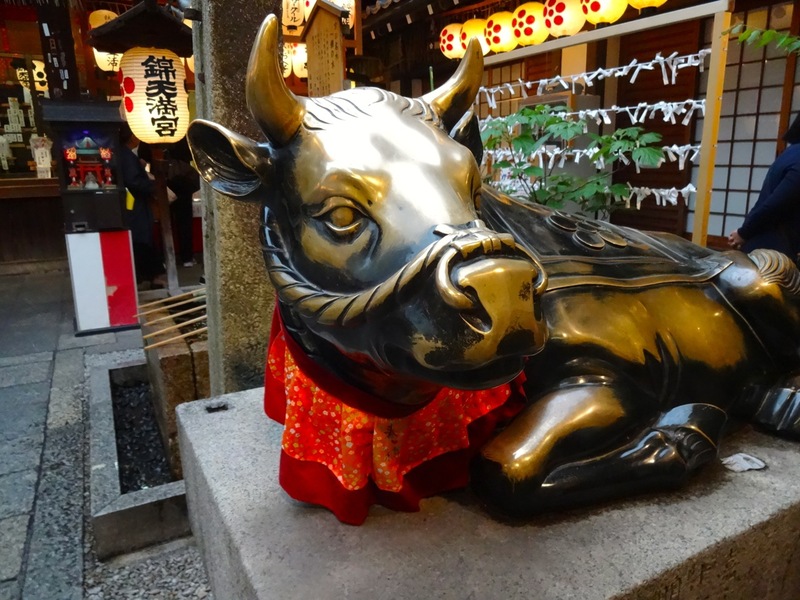 With four full days of touring Kyoto, the home of Zen Buddhism, we managed to see at least more than a few of the over 1, 600 shrines and temples as well as and peaceful manicured gardens, an imperial palace, and a castle in this city of 1.4 million. 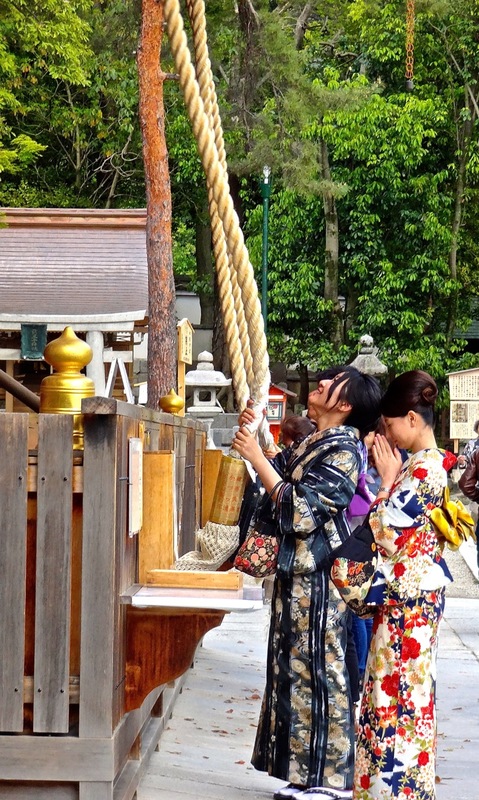 Buddhist stop to make an offering and ring a bell attached to a long cotton rope in front of one of Kyoto’s many temples. From the moment we stepped off the Haruka airport express into busy but orderly Sin-Osaka station and promptly got lost and more promptly rescued by a trio of non-English-speaking Osakians, we knew we not in China any longer. After a year of being pushed aside in lines, shoved on and off trains and buses, it was refreshing to watch the Japanese politely que up in neat rows for public transportation and for cars to yield to pedestrians. It didn’t take long to appreciate fifty people waiting together for the green walk sign to light before crossing in front of often empty streets. In Japan, rules are not mere suggestions. Alex seems about to be trapped by a giant thimble. 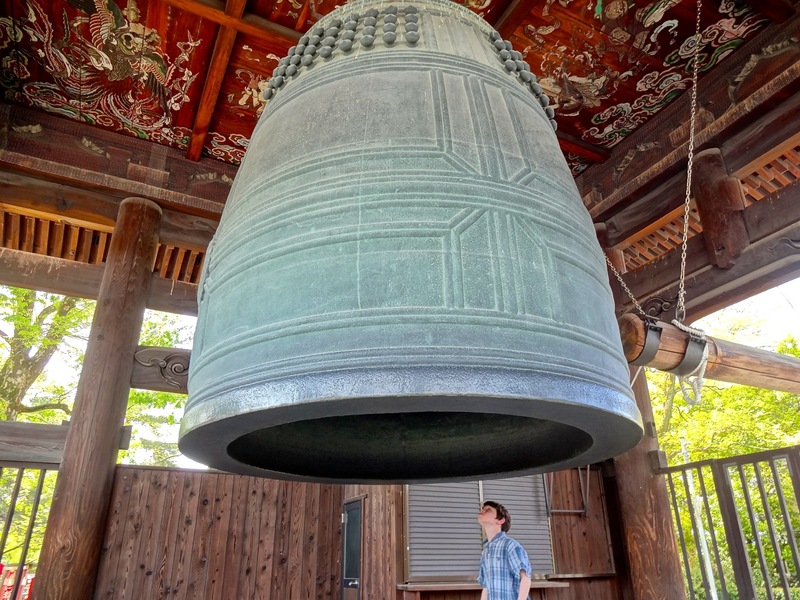 One of the largest bells in Kyoto dwarfs him as he plots how to make it ring. In China, no one expects rules to be followed nor feels any reason to consider the stranger next to you on the bus or in line or crossing the busy street. At the same time, I have rarely witnessed aggression over the lack of civility in the push to get on the bus, or the near miss in the crosswalk, it is just the way it works and most Chinese seem unfazed. After a night in Osaka, we used day two of our four day Kansai Area Pass which allowed use of the local and express trains and headed into Kyoto’s main station. Our hotel, immaculate and comfortable, but rather spartan on amenities was right in the middle of town and very near the covered walk pedestrian streets and dozens of small and large temples tucked away on side streets and in between more modern buildings. Scores of shops, restaurants, boutiques, open-air food stalls, and even public baths are scattered over the area within blocks of our hotel. 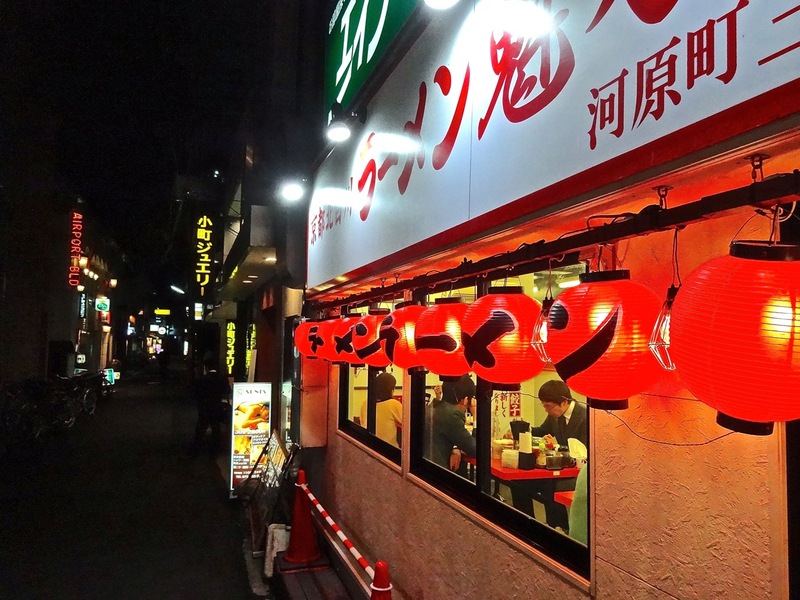 At night the whole area is lit up by colorful red and white paper lanterns and the smell of incense. Further south in the area known as Gion, traditional Geisha can be seen walking in their wooden shoes and wearing silk kimonos. 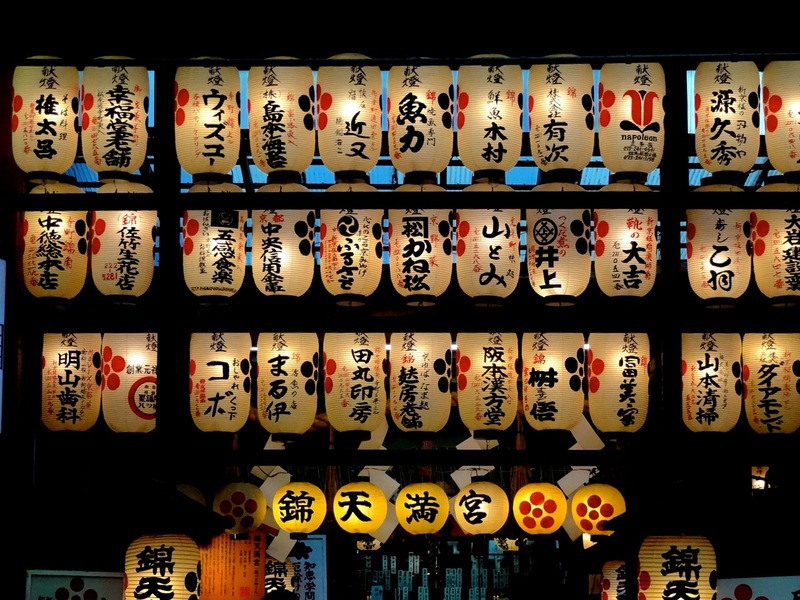 Kyoto was the capital of Japan for over a millenium and was largely spared major bombing during WWII, leaving intact a wealth of history, architecture, and culture. As the residence of the Emperor from 794 until the Meiji Restoration of 1868, the capital was moved to Tokyo, ending Kyoto’s place as the center of power in Japan, but not its importance culturally. 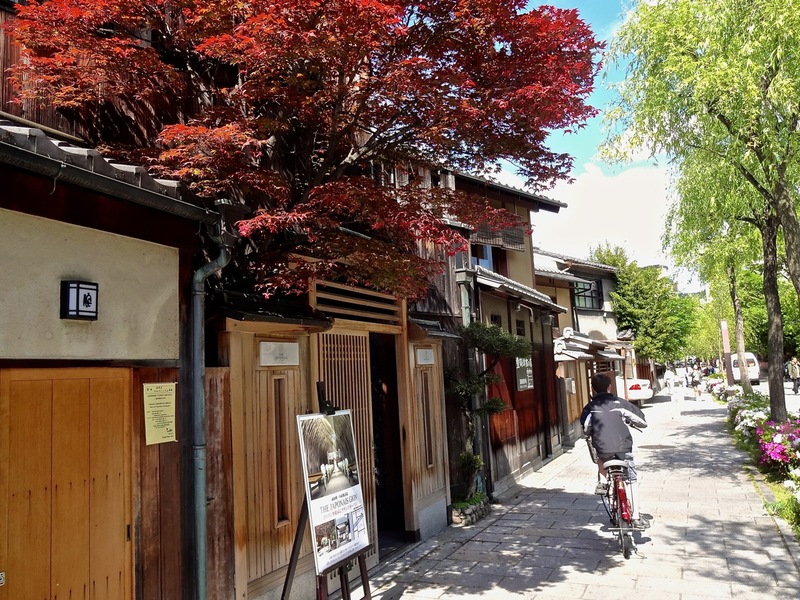 Machyia or tea houses dot the Gion quarter of Kyoto with their timeless wooden townhouses.